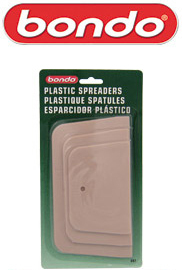 Contains 3 different size plastic spreaders. Sizes 4, 5 1/4, and 6 1/4 inch wide. Gives a smoother application of body fillers an spot putty. When using red cream hardener with Bondo body filler, the color of the mixture should match the salmon color spreader. For use with body fillers, fiberglass resin, and spot putty. A smooth application means less sanding.